^ Tasha Kates (November 15, 2009). "Residents chime in on city clock designs". The Daily Progress. Alexander Mattheus Michel (born August 10, 1970) is an American businessman, producer, and television personality, best known for being the first star of The Bachelor during its premiere season in 2002. Camila Carraro Mendes (born June 29, 1994) is an American actress, known for portraying Veronica Lodge on The CW teen drama series Riverdale. The Charlottesville Metropolitan Statistical Area is a Metropolitan Statistical Area (MSA) in the Piedmont region of the Commonwealth of Virginia as defined by the Office of Management and Budget (OMB). The Charlottesville Derby Dames (CDD) is a women's flat-track roller derby league based in Charlottesville, Virginia. Founded in 2007, CDD is a member of the Women's Flat Track Derby Association (WFTDA). Eugene Puryear (born February 28, 1986 in Charlottesville, Virginia) is an American journalist, author, activist, and politician. In 2014 he was a candidate for the at-large seat in the DC Council with the D.C. Statehood Green Party. In the 2008 and 2016 United States presidential elections, Puryear was the vice presidential nominee of the Party for Socialism and Liberation (PSL). John Henry James was an African-American man who was lynched near Charlottesville, Virginia on January 12, 1898, for having allegedly raped a white woman. James was an ice cream seller; "nothing else is known of him." This is a list of the National Register of Historic Places listings in Charlottesville, Virginia. 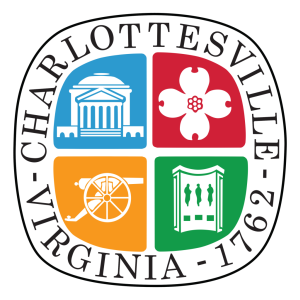 This is intended to be a complete list of the properties and districts on the National Register of Historic Places in the independent city of Charlottesville, Virginia, United States. The locations of National Register properties and districts for which the latitude and longitude coordinates are included below, may be seen in an online map.There are 65 properties and districts listed on the National Register in the city. The Piedmont region of Virginia is a part of the greater Piedmont physiographic region which stretches from the falls of the Potomac, Rappahannock, and James Rivers to the Blue Ridge Mountains. The region runs across the middle of the state from north to south, expanding outward to a width of nearly 190 miles at the border with North Carolina. To the north, the region continues from Virginia into central Maryland and southeastern Pennsylvania. The Corner is a seven-block collection of bars, restaurants, bookstores, and night spots on University Avenue in Charlottesville, Virginia, extending from 12​1⁄2 Street Southwest to Chancellor Street. located across the street from the University of Virginia. It is bounded by Graduate Charlottesville on the east and Bank of America on the west. While the university is in session, The Corner is especially active at lunchtime, when faculty, staff, and students adjourn there for the midday meal. Patrons of the Corner's sidewalk cafés can be found spending time over a good book or simply sipping coffee and people watching. Of the 67 businesses in the district, all but sixteen are locally owned, though there has been an increase in chain stores recently. The Corner is encompassed by a Charlottesville historic district, limiting redevelopment and demolition.As of 2000, The Corner had 26 restaurants, eleven bars, three coffee shops, one hotel, and one apartment building. The Daily Progress is the sole daily newspaper in the vicinity of Charlottesville, Virginia. It has been published daily since September 14, 1892. The paper was founded by James Hubert Lindsay and his brother Frank Lindsay. The Progress was initially published six days a week; the first Sunday edition was printed in September 1968. Lindsay's family owned the paper for 78 years. On November 30, 1970, the family announced a sale to the Worrell Newspaper group, which took over on January 1, 1971.T. Eugene Worrell, of Bristol, Virginia, owned about two dozen rural weekly newspapers and a few dailies, all with less circulation than the Daily Progress. The Progress immediately became the group's flagship paper, and Worrell moved his newspaper group headquarters to Charlottesville. Faced with major newspaper industry change, in 1995 Worrell sold his newspaper properties to Richmond-based Media General, which was later purchased by Nexstar Media Group, as a part of a larger $230M deal. In the 21st century, Media General sold the Progress' printing press, and reorganized its operations to print multiple newspapers from other printing plants it controlled. On May 17, 2012 Media General, Inc. announced signed agreements with Berkshire Hathaway, Inc., whereby a subsidiary of Berkshire Hathaway, BH Media Group, will purchase newspapers owned by Media General, including the Progress.Following the Unite the Right rally in Charlottesville in August 2017, Paul Chadwick of The Guardian wrote that the staff of the Progress "demonstrate in a practical, relatable way the importance of journalism to community, civil society and functioning democracy. "Ryan M. Kelly, who worked for the newspaper at the time, took a photograph of the Aug 12 vehicular attack that resulted in the death of Heather Heyer won the 2018 Pulitzer Prize for breaking news photography. University Hall is an 8,457-seat multi-purpose arena on the University of Virginia Grounds in Charlottesville, Virginia. The arena opened in 1965 as a replacement for Memorial Gym, which is still used as the home to the volleyball and wrestling teams. Like many arenas built at the time, the arena is circular, with a ribbed concrete roof and blue and orange seats (the orange seats arranged in a "V" near the top of each section) surrounding the arena. Unlike many other facilities, however, the floor was never lowered for additional seating around the court, leaving large areas behind press row, the team benches, and the announcer's table empty during games. University Hall was replaced by the John Paul Jones Arena as the home to the men's and women's basketball teams in 2006. However, the women's basketball team made the Women's National Invitational Tournament and played and won two WNIT games in University Hall. The Virginia–Virginia Tech football rivalry is an American college football rivalry between the Virginia Cavaliers football team of the University of Virginia and Virginia Tech Hokies football team of Virginia Tech. The two schools first met in 1895 and have played annually since 1970. Since 1964, the game has always been played at either Lane Stadium or Scott Stadium on the campuses of the two universities. But the series has at times been played in Richmond (1903, 1904, and 1957); Norfolk (1940, 1941, and 1942); and at Victory Stadium in Roanoke (in 17 of the 19 years between 1945 and 1963). Since 2000, the game has been held in late November, often on Thanksgiving weekend. Virginia Tech leads the series 58–37–5, and the Cup series 20–3. Virginia Tech has held the Commonwealth Cup for the past 15 years with UVa's last win coming in 2003 (UVa's only win this century). Virginia Tech holds one of the longest active winning streaks against a conference rival in all of college football. The game counts for 1 point in the Commonwealth Clash each year, and is part of the greater Virginia–Virginia Tech rivalry. WCAV is a dual CBS/Fox-affiliated television station licensed to Charlottesville, Virginia, United States. It broadcasts a high definition digital signal on virtual and UHF channel 19 from a transmitter on Carters Mountain south of Charlottesville. The station can also be seen on Comcast Xfinity channel 6 and in high definition on digital channel 806. Owned by Gray Television, WCAV is a sister station to low-powered ABC affiliate WVAW-LD (channel 16) and silent Class A station WAHU-CD (channel 27). WCAV and WVAW-LD share studios on 2nd Street Southeast in downtown Charlottesville. WCVL-FM (92.7 FM) is a classic country formatted broadcast radio station licensed to Charlottesville, Virginia, serving Charlottesville and Albemarle County, Virginia. The station is owned by Saga Communications of Charlottesville. WQMZ is an Adult Contemporary formatted broadcast radio station licensed to Charlottesville, Virginia, serving Charlottesville and Albemarle County, Virginia. WQMZ is owned and operated by Saga Communications. WVAW-LD is a low-powered ABC-affiliated television station licensed to Charlottesville, Virginia, United States. It broadcasts a high definition digital signal on virtual and UHF channel 16 from a transmitter on Carters Mountain south of Charlottesville. The station can also be seen on Comcast Xfinity channel 3 and in high definition on digital channel 803. Owned by Gray Television, WVAW is a sister station to dual CBS/Fox affiliate WCAV (channel 19) and silent Class A station WAHU-CD (channel 27). WVAW-LD and WCAV share studios, known as the "Charlottesville Newsplex", on 2nd Street Southeast in downtown Charlottesville. The Newsplex stations have a resource sharing alliance with sister station WHSV-TV in Harrisonburg, and some behind-the-scenes operations are shared between them. WVAX is a Sports formatted broadcast radio station licensed to Charlottesville, Virginia, serving Charlottesville and Albemarle County, Virginia. WVAX is owned and operated by Saga Communications. WWWV (97.5 FM) is a classic rock formatted broadcast radio station licensed to Charlottesville, Virginia, and serves Central Virginia and the Central Shenandoah Valley. WWWV is owned and operated by Saga Communications.